With ‘White Butterfly’, the ratio of nitrate to ammonium nitrogen fertilization practices do not influence postharvest plant quality while disease (Xantholonas campestris) severity was very slightly reduced when nitrate forms were used in higher ratios. Low levels of phosphorus can cause dead spots on lower leaves. 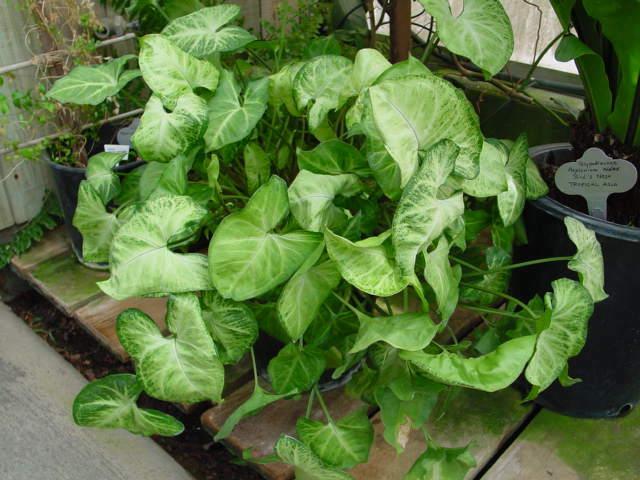 Common relatives include philodendron, anthurium, pothos and caladium. Leaves are arrow-shaped on long stalks, up to 6 inches long, often with yellow markings. Leaves also form a clump. Somewhat chill sensitive but not nearly as sensitive as many other foliage plant species. However, it is still recommended that they be stored above 55 degrees F.
Young plants are very difficult to identify since their leaves seldom resemble more mature specimens. The specific epithet name “podophyllum” means stalked-leaves. Syngonium is from the Greek “syn” (together or joined) and “gone” (womb), in reference to its united ovaries. Keep plants pinched to maintain form and encourage new growth. Poole and Conover (1993) stored ‘White Butterfly’ at 36-46F from 1-4 days and subsequently noted no damage.